What would happen to your productivity if you had a way to block Internet access to your favorite time-wasting websites like Facebook, Twitter, Wikipedia and trashy celebrity gossip blogs? If you are like most people, you would probably get a lot more work done. 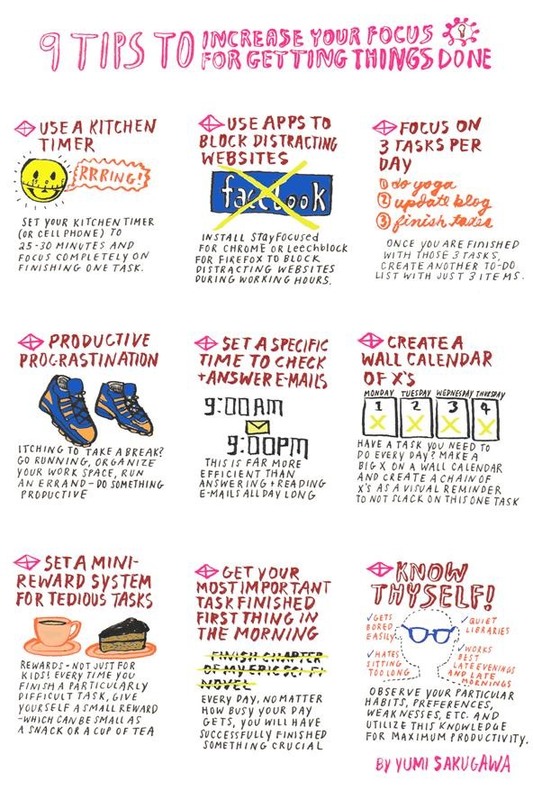 Listed below are nine ways you can increase your focus for maximizing your productivity. Using a combination of visual reminders, productive procrastination, time management, and streamlining your daily to-do lists, incorporating just a few of these habits will make a huge positive impact on your day-to-day workflow. Got your own productivity tips that help you stay focused? Share with us in the comments below! I started using the StayFocused browser extension for Chrome (you can search at the Chrome web store, it's free here) to block my favorite time-wasting sites and it's AMAZING!! Definitely feel so much more clear-headed and focused throughout the day when I know the option to obsessively check my favorite mental junk food blogs isn't allowed. really good advice, yumi! i'd love to see you elaborate on "knowing thyself" - cuz i know myself, but i can't motivate myself to get out of my rut! I use this principle for myself as a way to know what particular environment conditions are most conducive for my productivity. For example, I know I work best in the mornings with headphones to music and I work extremely well in cafes with background noise and especially if I am with other people--so I try to do those things as much as possible. I also know that when I tell other people about my projects I feel more accountable to finish them or do them well. Finally, whenever I am feeling unmotivated or feel this overwhelming desire to procrastinate, I know that sometimes I just need a day to do absolutely nothing and not feel guilty about it--or really be honest about why I am slacking off on something. As for your scenario where you are experiencing difficulty motivating yourself to get out of your rut, maybe you can try writing down a list of why you aren't feeling motivated, what conditions you need to be motivated and a list of small action steps you can do to remedy this problem. I know these sort of things are much easier said than done.... I hope this helps a little bit! I will also add for everyone else one amazing principle I stole from Zenhabits (www.zenhabits.net) --I have found that focusing on changing one habit or learning one new productive habit at a time per month has worked tremendously well for me.